One thing I've noticed, time and time again, when I'm at a craft show or otherwise when I'm selling my jewelry to people, is that most folks don't know what colors can pair together. If someone buys a colorful necklace from me, they often ask what they can wear it with. I then rattle off a bunch of options and they walk away satisfied. That got me to thinking, though. Not everyone is so adept with pairing color. I'm an artist, so it's to be expected that I'm good at pairing colors. And since I'm not a particularly selfish person (well, not about this, at least! ), I thought maybe I could help others by offering some tips, complete with a photo. 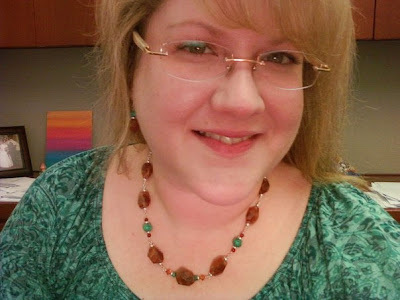 First tip: Today I'm wearing a green shirt that has shades of turquoise to it... and my necklace is sunstone, which is a gorgeous stone with shades of dark orange, with turquoise accent beads. So... try dark orange with turquoise green. It's an awesome combination! Sunstone's metaphysical properties: The sunstone gem is a leadership stone, and brings leadership qualities to its wearer. It aids in dispelling fears and phobias and also decreases stress and lifts depression. Sunstone promotes grounding and protection. Sunstone gems also warms the heart and allows the person to get in touch with their life force. Turquoise's metaphysical properties: Turquoise is porous, so contact with liquids, oils or even perspiration should be avoided. Turquoise is considered a good general healer for all illnesses and excellent conductor. Induces wisdom and understanding, enhances trust and kindness. Brings the qualities of mental and spiritual clarity. Is this helpful? Let me know what you think!